Sonic the Hedgehog 171 is the one hundred and seventy-first issue of the Sonic the Hedgehog comic series. It was released in January 2007. This comic features two stories: "I Am" and "Enforcers". The story takes place straight where last issue left off, with Shadow the Hedgehog demanding the location of Professor Gerald's diary from Eggman, who refuses. Shadow then grabs Snively by the hair and threatens him. Snively eventually tells him what he wants to know, but Shadow pulls his hair out regardless for wasting his time. He grabs Gerald's diary, encoded onto a disc, from the hidden pocket of a book. Shadow then heads off to Freedom HQ as it is the only place friendly place he can access with the technology needed to read the diary. At Freedom HQ, Sonic is wondering where Fiona Fox is, with this being the latest of her disappearances. Tails then comes flying in and tells Sonic that Shadow is heading towards the HQ while under attack from flying Egg Pawns. The Egg Pawns' special electrical weapons manage to damage Gerald's diary while Shadow is trying to escape. Sonic and Tails destroy the Egg Pawns and Shadow, angry at the possibility of damaging the diary, yells at them for not arriving sooner. Sonic is annoyed by the lack of gratitude and Shadow relents, apologizing to the surprise of the pair. He tells them about the diary, and how it has all the answers he's been searching for. They then head back to Freedom HQ and Tails informs Shadow that the data is so old and damaged that if they try to access it, they could end up corrupting the whole thing, but Shadow refuses to back down. NICOLE then suggests that they could physically interface with the data, and they decide to do it. Inside the diary data, Sonic, Shadow and NICOLE (in her lynx form), find themselves standing in what appears to be the inside of the Space Colony ARK. They head off in search of Shadow's answers, and the hedgehog soon meets up with a holographic representation of an old friend. Back at Freedom HQ, the alarms go off, alerting Tails to Snively's arrival in a giant mech dubbed the Egg Lobster. Finding a foreign signal in the base, Tails realizes with shock and disgust that Snively had individual tracers planted in his hair. Knuckles goes outside to confront Snively, saying that as he once experienced being lost without a past, he won't let anyone interfere with Shadow finding out about his own. 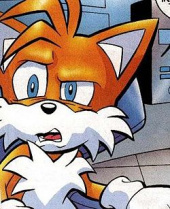 Tails on realizing that Snively placed trackers on his own hairs. Back in Gerald's diary, Shadow is overjoyed to see Maria, who he thought he had lost forever. Explaining that he's been asleep for fifty years and has forgotten his purpose, she leads them to her grandfather and he reveals the truth to his "son." He tells Shadow that, initially, his body was to be the source for a cure to the disease Maria had developed, Neuro-Immuno Deficiency Syndrome. However, his research only carried him so far. Desperate, he sought the aid of Black Doom, a monstrous alien who wanted Shadow to be his greatest weapon. Black Doom helped in the creation of Shadow and gave him his rare skills in Chaos Control. He planned to return in fifty years' time to have Shadow help him invade Mobius. Instead, Gerald planned for Shadow to protect the planet against Black Doom and his Black Arms when they returned (Sonic and NICOLE discuss this, thinking that the Black Arms are overdue in their attack - they were held up by the Xorda). Slightly overwhelmed by these revelations, Shadow wonders what his purpose is - a cure, or a weapon? Gerald tells Shadow that he is to be the planet's greatest protector, and while he apologies for leaving so much on Shadow's shoulders, he tells his "son" that he is well prepared for it. However, the digital matrix begins to further deteriorate, and NICOLE informs the others that they must quickly leave. Shadow is upset at losing Maria again, but she tells him that she will always be with him if he holds her memory in his heart. They exit the fragmenting reality. Upon their return, Tails informs the two hedgehogs that Knuckles is fighting Snively outside Shadow races off and outside where Knuckles is being crushed in the pincer of the Egg Lobster. Shadow spindashes through the arm, freeing Knuckles, and throws Snively's hair in his face. He tells Snively to tell Eggman that he is the protector of Mobius and will no longer serve him. With Shadow's questions answered, Sonic goes to get his own answers from Fiona as to why she keeps disappearing. The Dingoes are attacking Echidnaopolis on Angel Island. Wynmacher attempts to protect his family from the onslaught, and soon the the Destructix intervene, fighting off the dingoes. Looking on from afar, Guardian Locke recognizes them but doesn't understand why they rescued the echidnas. Dr. Finitevus then arrives via Warp Ring and reveals they he told them to do so, and both he and the Destructix had reformed, but Locke does not believe him. Finitevus then brings forth Dimitri to vouch for him. Dimitri says Finitevus saved what was left of his life, but Locke still holds doubts about Finitevus' claim. Finitevus then offers to let the Destuctix, under his command, keep guard over Angel Island and the Master Emerald so Locke can search for the missing Brotherhood of Guardians, which gets Locke's attention. He still hesitates until Finitevus suggests they contact Knuckles instead, and, still angry with his son, Locke refuses and agrees to let Finitevus look after the emerald, saying he will return frequently to check on him. He leaves with the Warp Ring provided by Finitevus. Upon Locke's departure, Dimitri shows shame at having lied about Finitevus' intentions to convince Locke to leave. Finitevus however believes it necessary to his plans: to use the Master Emerald to bring Dimitri back to his old form of Enerjak. Black Doom briefly appears in Gerald Robotnik's flashback in his diary. The Black Arms and Black Doom's appearances were deliberatly limited by SEGA, thus limiting Black Doom to a brief cameo. Knuckles is briefly seen with Extreme Gear. This issue marks Dimitri's first appearance since Issue #118. It was stated by Lien-Da in Issue #139 that "Dimitri is no longer with us", implying the character had died. Dimitri's whereabouts during his long absence is explained in Issue #181 and Issue #183. 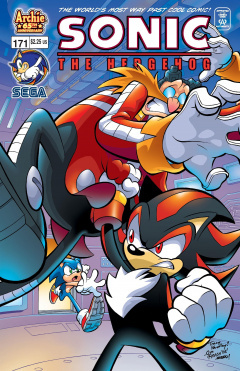 This issue is somewhat of a comic book tie-in with the 2005 video game, Shadow the Hedgehog. The title of the first story is based on the name of the main theme song from the videogame Shadow the Hedgehog, "I am... (All of me)". Likewise, Shadow's line at the end of the story, where he exclaims to Snively who he is and what he was made for, is identical to Shadow's revelations in the alternate endings of the game ("I am Shadow the Hedgehog...This is who I am").